X-Carts are high-density storage carts that maximize your space by sliding together and apart along a fixed aluminum track. 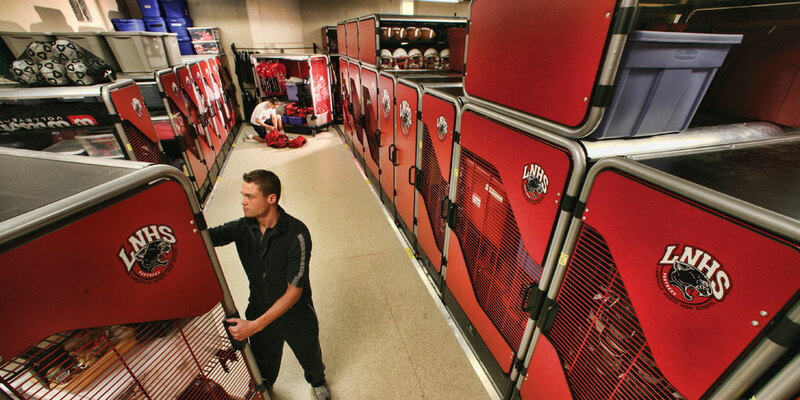 Transforming your equipment room into an organized, clean, professional storage space is easy with GearBoss. Our rugged X-Carts are part of a smart, efficient system of storage that will save space, protect your equipment, and save you loads of time spent organizing. X-Carts roll laterally along a fixed aluminum track creating aisles between carts when you need to get at your equipment and closing back together when you don't. 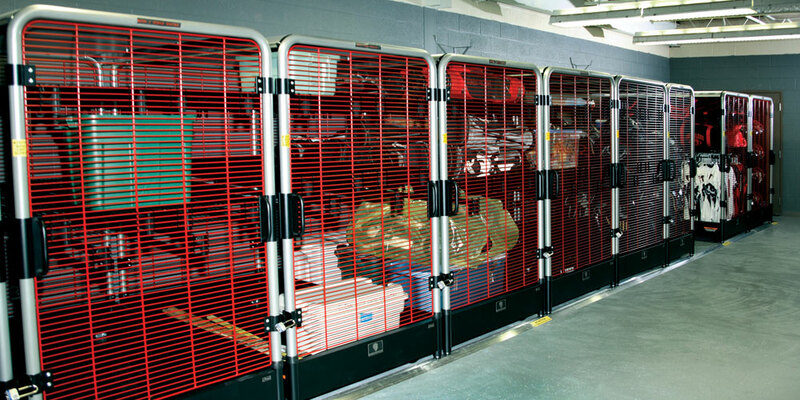 Carts can be configured with a full range of panels, doors and grilles in your team colors. You can also add accessories like doors, helmet hangers, shoulder pad stackers, hanger rods, shelves, dividers and more. 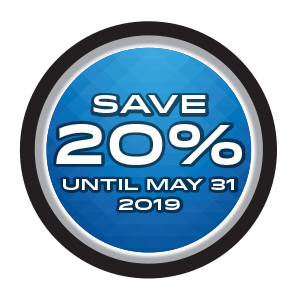 Economize Space - GearBoss Systems can store twice as much equipment in the same volume of space by reducing aisles and economizing cubic storage space. 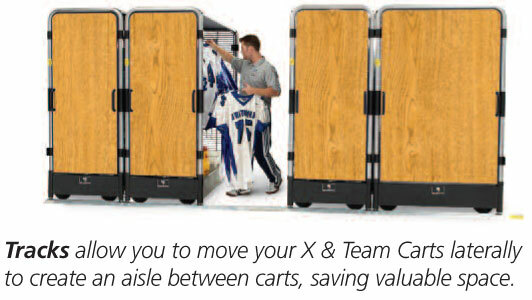 Flexibility - GearBoss carts can be rearranged and reconfigured as often as you need. Security and Organization - Improve security, inventory control and oversight with a locked and organized room. 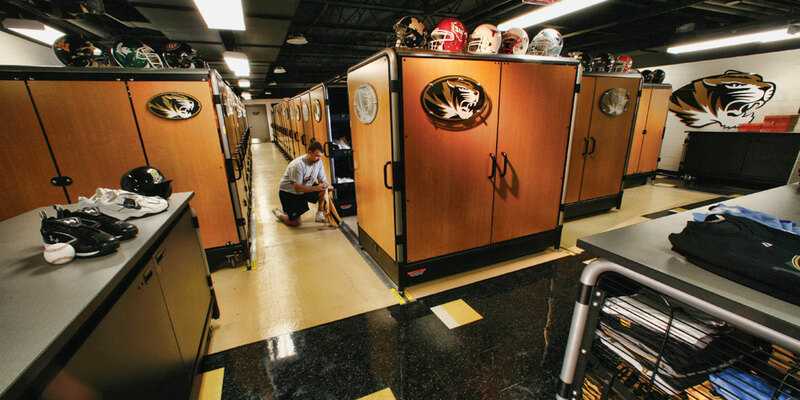 Show your Pride - Every space is a reflection of your program and with GearBoss organization and school colors you can take pride in your equipment room. 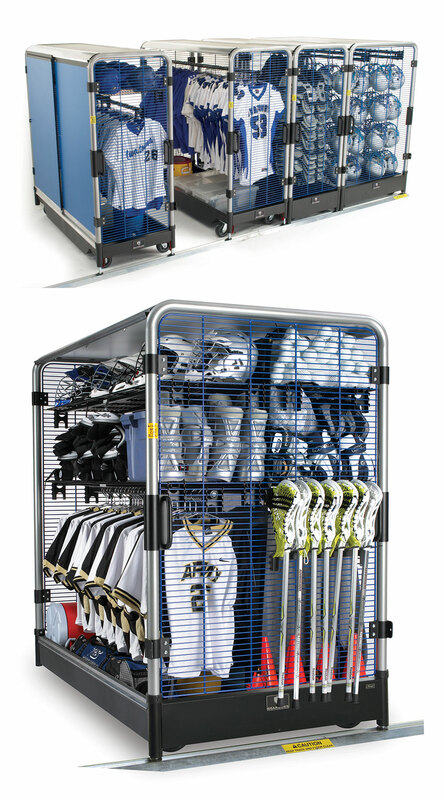 Easy to use, easy to access, efficient storage system can handle all of your uniforms and gear. Please call your Wenger representative for consultation. Access: With GearBoss, everything is accessible in one place, right at your reach. It's almost like a walk-in closet. The GearBoss system enables us to utilize our space most effectively. Sanitation: Air is free-flowing through the GearBoss carts and shelving – I think that's really important for sanitation and maintaining the quality of the fabric and equipment. Security: Increased security is definitely a benefit of the GearBoss carts. Even when the storage room is open, the locked carts are still secure and only accessible to coaches with keys. GearBoss maximizes our available storage space and protects our investment. We easily have $100,000 of uniforms and equipment. The carts keep the equipment off the ground, safe from pests and moisture. The GearBoss system sold itself, considering the cost of lost and damaged uniforms. There's no reason to throw money down the drain when GearBoss offers a complete solution that works for all sports. With GearBoss, we can control and monitor our equipment, and help keep our facility clean. It fits each sport's needs – plain and simple. Before GearBoss, storage was a constant battle. It became less cost-effective than just trying to find a system that would work for everyone. We have close to 150 students involved in football, and the space savings for this equipment alone is amazing with GearBoss. For distributing equipment efficiently, we can roll the carts down to our stadium and process everyone quickly. It's a beautiful thing. 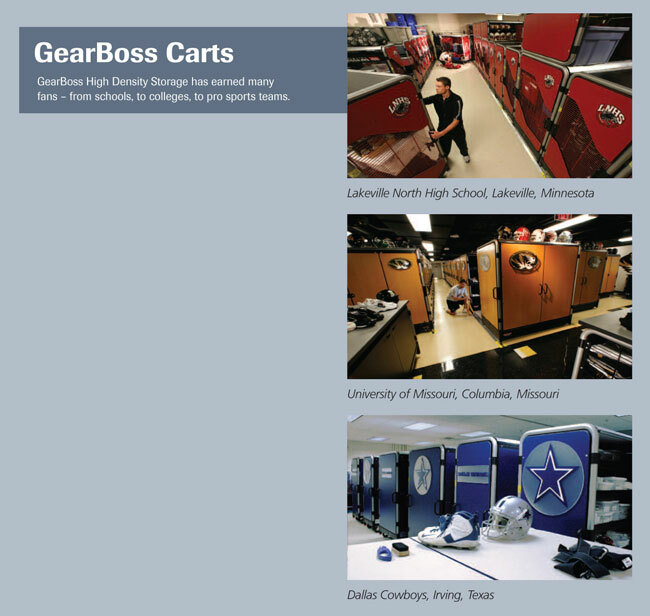 The GearBoss Athletic Facilities Planning Guide helped me plan the layout of our storage area, including GearBoss carts, to make our available space work better. Before GearBoss, basically everything was homemade. We had some bins built and also chain-link fence cages where people stored things, and some shelving. It ended up being a conglomeration of many different things; it really wasn't a very good system. It fit the needs for the time, but that's all it did. It really didn't help us very much. The GearBoss system enables us to utilize our storage space to its full potential. 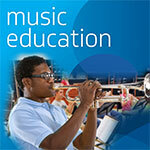 Coaches can quickly see what they have – it's organized and easily accessible. I've received nothing but compliments. 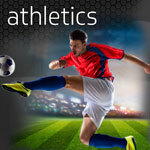 GearBoss® will help with all aspects of your athletic program. 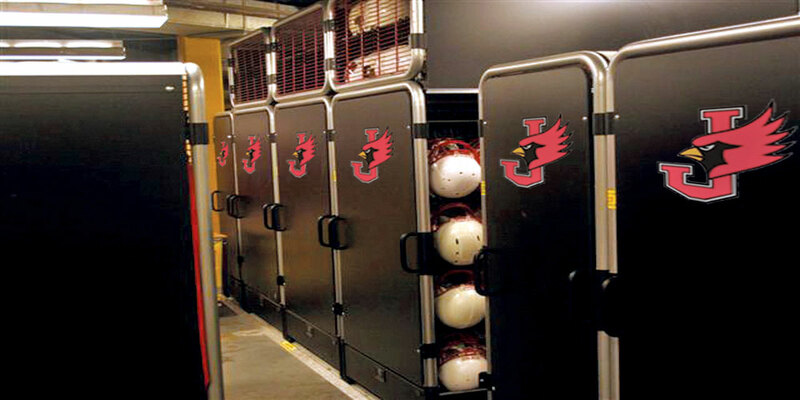 From lockers, to storage, to equipment transport and fund-raising solutions, GearBoss products save you time, space, and effort. 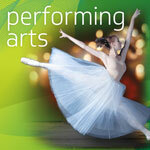 They’re flexible and customizable.